Established in 1989, Catering by Michael has become one of Southwest Ohio's premier caterer's. We pride ourselves in outstanding levels of service and superb menu selections. As a caterer at many of the area's finest venues, Catering by Michael provides elegant catering services for wedding receptions, corporate events, conferences and other very special occasions. Under the direction of Executive Chef, Mike James, the culinary staff of Catering by Michael creates exquisite menu offerings, all with an eye on appealing presentation, creativity and excellent taste. 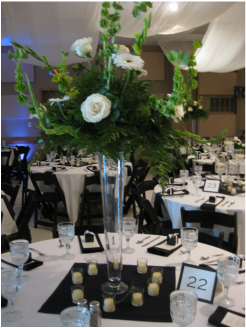 Every detail of your event is attended to by one of Catering by Michael's experienced professional event coordinators. The event coordinators ensure that each step of your event planning is anxiety-free and executed with your satisfaction and your guests' enjoyment in mind. The ultimate goal of Catering by Michael is to make your very special event one that will be remembered by you and your guests. From your first call (937.548.8144) to Catering by Michael until the final moments of your event you will see why Catering by Michael is one of Southwest Ohio's leading caterers.